You are here: Home » MEDIA » Books » War Master’s Gate (Shadows Of The Apt book nine) by Adrian Tchaikovsky (book review). War Master’s Gate (Shadows Of The Apt book nine) by Adrian Tchaikovsky (book review). I put off reading ‘War Master’s Gate’, the ninth book in Adrian Tchaikovsky’s ‘Shadows Of The Apt’ series, for quite a while because this is one hefty doorstop of a book. In the over-size paperback version I have, its 716 pages weighing at almost 1 kg, making it a little impractical for taking, well, anywhere. Size aside, this was a book I’d been looking forward to and it certainly delivered on plot, action and, as I’ve come to expect from Tchaikovsky, fantastic characters. The armies of the Wasp Empire had been thrown back from the gates of the Beetle city of Collegium, but all sides knew that peace couldn’t last. The Empire are back and this time they’ve brought a few new tricks and, in an uneasy alliance, their troops are fortified by the skilled fighters of the Spider-kinden. Collegium will fight to the end, but defeat is looking likely as troops are depleted and calls for surrender grow louder. Stenwold Maker, War Master of Collegium, may be fighting his final battle and the outcome may take him away from all that he holds dear. Elsewhere, his niece Cheerwell is racing Seda, the Empress of the Wasps, to a source of great magical power. Both blessed with magical gifts from the ancient Masters of Khanaphes, only one will prevail and if Seda triumphs, the whole world will bow to her power. Yet the stakes may be higher than any of them realise. If you’re planning to pick up ‘War Master’s Gate’, the chances are that you’ll already have read the previous eight books in this series. If not, I’d strongly suggest you put it down and start at the beginning. You’ll already know the style of Adrian Tchaikovsky and enjoy the fierce and detailed battles, the strong characters and the beautifully drawn world. What more can I tell you? Well, I can tell you that it doesn’t disappoint. There’s a nice blend of two very different plot strands that intertwine neatly. One focuses on the battles to hold Collegium and fight off the latest Wasp onslaught and the other following Cheerwell and Seda through the forests of the Mantis-kinden to find a potent magic source. They make a nice contrast of slow and mysterious with fast-paced and action-packed so that things vary in pace perfectly. It also creates a nice balance of old and new, with one strand focusing on the Apt and their advances in warfare while the other showcases the inapt and their traditions. There are some wonderful character details all round, with plenty of moments of introspection and moral points to consider, yet never too heavy. The battle scenes, as you’d expect, are abundant and glorious. Battles in the air, battles on the ground, new kinden and new weaponry means that, although they are plentiful, the fight scenes never get dull. I enjoyed every page of this book and am impressed that even in the ninth book in a series, Tchaikovsky keeps things fresh and doesn’t let things slip at all. Of course, the real test is the ending of a series and that’s book ten, ‘The Seal Of The Worm’, for the ‘Shadows Of The Apt’. 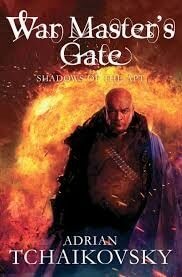 I can’t wait to read it and the ending of ‘War Master’s Gate’ certainly sets it up to be something spectacular. « Beautiful Blood by Lucius Shepard (book review).